This is the role of a proper gentleman: to carefully husband his wealth, to serve in public office, and to speak politely at formal dinners. In other words, the proper gentleman is intolerably dull. Maybe it's time to have a little fun. The Prodigals Club is a secret fraternity of young gentlemen who are attempting to offend high society as thoroughly as possible. They compete with each other by getting rid of their possessions, by losing votes in an election, and by angering influential people. 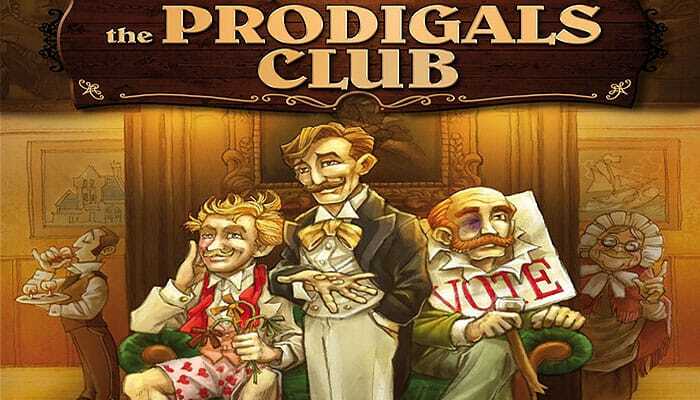 In The Prodigals Club, you compete in three separate competitions: trying to lose an election, trying to get rid of all your possessions, or trying to offend the most influential people in high society. You can play any two competitions in combination or play all three simultaneously. Each competition interacts with the other two. To win, you need to balance your strategy and play all the competitions well. The game is played as two or three simultaneous competitions, each with its own scoring system. In each competition, you are trying to lose points. You play five rounds, or until one player reaches a score of zero in one of the competitions. But it's not a race to see who can get to zero fastest. It's a game to see who can most effectively balance the different goals.